So I have really been into juicing lately… and of course that means tons of carrot pulp, usually I just compost it. One time I did try to make soup with it, but don’t ever make that mistake… super grainy and all the juice was out of the carrots so the soup was NOT sweet and creamy like it normally is. I know there are a ton of recipes out there for using carrot pulp for the fluffy consistency of raw, dehydrated cookies, but really I wanted something sweet and QUICK! I happened to have Bob’s Red Mill Gluten Free Vanilla Cake Mix on hand, so I thought to myself… “why not try to make it carrot cake?” I juiced 4 carrots and added the juice back to the pulp. Then I dumped in the whole cake mix and eventually it turned into thick cake consistency. I did add a couple of other things and they are in the recipe below. 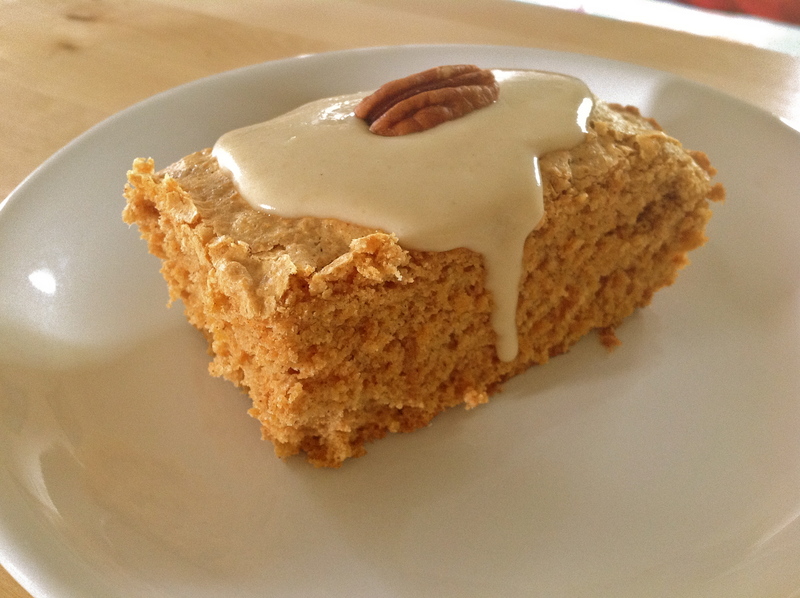 I love cashew cheesecake, so I made a variation for a Cashew Cream Cheese Frosting and DELICIOUS!!! Optional: coconut flakes, chopped dates, raisins, pecans, whatever you like! If you are using a food processor to make frosting then I would highly recommend soaking cashews for at least 4 hours prior. I used my vitamix and didn’t have the foresight to soak beforehand and it still turned out super smooth. When you refrigerate this frosting it will thicken or if you use more cashews. I liked it more like a glaze when I first made it and then after refrigerating it was thick like a super buttery frosting. Just use frosting as needed and don’t put on the whole cake (since you need to refrigerate the frosting and that would dry the cake out). Top piece by piece and enjoy! I love cake and I love this cake! Thanks so much! I love it too!! !